Here’s a very good productivity notebook (for office/student work, video marathons, and browsing) with a capable 25w MX 150 video card for Photoshop work, light video editing, and some PC gaming (within limits). The premium build quality alone deserves praise. Here’s our full review. There’s an overall quiet, low-key, conservative, considered look to the Lenovo IdeaPad 530S – small bezels, no bottom-placed nose-hair-focused webcam, a generously sized touchpad, mute colors (no screaming hues or high schoolish color accents), “soft” rounded corners, no shiny metallic look, no boxy-sharp aura, no gaming laptop motif, no overkill thin-ness that can compromise typing and battery life; even the spartan lid only has a Lenovo branding on the bottom side (and it’s not reflective). The fingerprint sensor is placed outside the touchpad, thank God. There’s a soft visual symmetry in place here, it doesn’t look cheap, and the aluminum chassis validates that perception when you hold the 530s: sturdy build, with a slight heft that’s reassuring. There’s very little for your eyes to fixate on (and maybe dwell on, or complain about) and that’s a good thing. You get this feeling – holding, lifting, carrying this notebook around – that it will survive getting jostled around and slightly crunched in your backpack. With the lid closed, pressing down on the center doesn’t give a hint of a wobble. You’d have to press hard on the center of the keyboard to see some flex. And torquing the display doesn’t do much. Although there’s some slight flex on the palm rest areas, but your hand knows you’re pressing down on metal, not plastic. Here’s our real world unsolicited sturdiness test. Our 6.3kg cat actually sat on our review unit, and we were afraid the unit wouldn’t work after that. It still did. Our other cat, weighing 3.4kg, jumped on me while the 530S was on my lap, and her weight forced the laptop to open up with the display flat out. No scratch or dent or restart needed. I gave her the attention she sought (belly rubs) and she went on her way and I continued writing. Then, while the lid was closed, our other cat accidentally pushed aside, while playing, an electric fan, which fell on the lid of the 530S. We wiped off dust from the lid. No scratches. We woke up the notebook from sleep and it’s still working. Wow. Classy and conservative metal body laptop. The metal lid and the frame housing the keyboard are also surprisingly immune to scratches and fingerprints. We know so because we’ve been using the 530S heavily for nearly a month now, and various things already fell on the laptop’s lid, things we thought would leave scuffs we’d have to toothpaste out. But there’s nothing on the lid until now. Just a Spartan smoothness. We don’t find the need to constantly microfiber-wipe the 530S, which is a good thing. The Lenovo IdeaPad 530S has upper midrange notebook price and specs, but looks and handles like a premium device. Granted, it reminds you of Macbooks, but this one is around P30,000 less and runs the latest 8th Gen Intel processor (plus we’re not all macOS lovers or, for that matter, dongle life lovers – the IdeaPad 530s has all the ports you need). Out of the Box: 65W Charger Brick, Pamphlets, and the Lenovo IdeaPad 530S. We did say at the beginning that the build alone deserves praise. It does, and we think that the build quality can differentiate the 530S from other laptops within the same price range (more on this below) and with the same or nearly the same specs. With the lid closed, the clamshell notebook looks solid, minimal, compact, and graceful. The small Lenovo branding on the side is a nice minimal touch that keeps reminding me that I’m carrying around an elegant laptop. We don’t mind the slight heft – at 1.5kg, it’s about half a kilogram heavier than other thin and light notebooks – something those used to lighter laptops (or those with arms that easily tire) may be accustomed to. If, in exchange for the solid build, quiet design, and only P50-ish pricing (many 1-1.2kg laptops are in the P65k+ price range), we get half a kilogram, then we’re fine with it. The IdeaPad 530S has a very good 14-inch IPS anti-glare display, with good contrast (deep enough blacks despite not being OLED), excellent viewing angles (no color shifts from viewing it from top, bottom, and sides), and its colors appear natural, instead of the overly saturated-popping-vivid colors of AMOLED displays found on smartphones and expensive notebooks and tablets. Sure, you can crank up the saturation via Intel Graphics Settings (right click on desktop to find it), but we didn’t find it necessary. Out of the box, the default color profile is fine for most work and video binging needs. The display has very small 5.75mm side bezels, but the top has enough space (and slimness) to house the HD webcam. The bottom bezel, largest of the three display sides, has nothing on it. Not even Lenovo branding. Again, another minimalist touch. The display barely flexes, which is reassuring, and it can be pushed far back down, up to 180 degrees, so you get this “clipboard” mode, which is nice for carrying the laptop around. By the way, the lid cannot be opened with one hand. A shame, but that’s nitpicking. 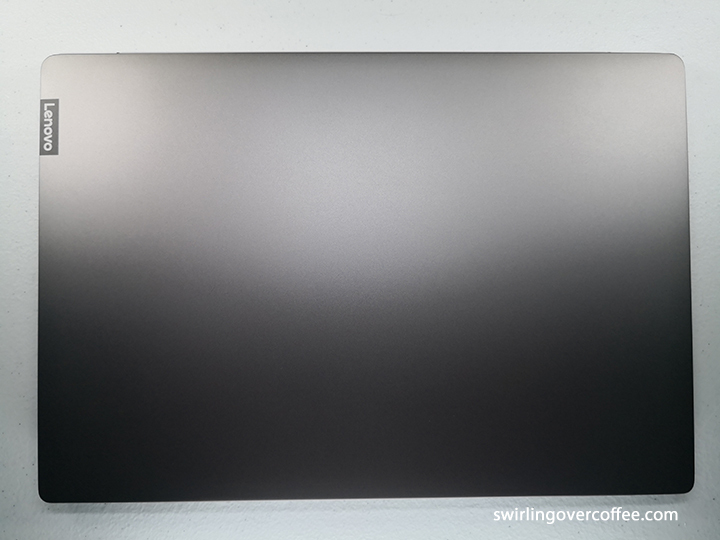 The display is not really matte (Lenovo calls it anti-glare) but holds itself well outdoors – it’s not that glossy. Neither is it touchready, which is another shame, since the display hinge is stiff enough to withstand taps and swipes with little wobble. That means having a stylus would have been good for underscoring documents and doodling comments and signing PDFs. But again, that’s a nitpick. The 14-inch Full HD IPS display has 141 ppi, gets plenty bright at 250 nits (helped by an anti-glare coating), provides a very good 780:1 contrast ratio (at least when indoors), and reaches 48% of the Adobe RGB display gamut and 65% sRGB (both of which are the usual numbers for an upper midrange notebook’s display). But don’t be fooled by these color gamut numbers – the display is good. Outdoor viewing under the shade is passable (but still glossy), and glaring, angry sunlights overwhelms the display altogether (something that the P80k-ish Macbooks have no problem with). Still, if you want a Windows laptop with very high color accuracy out of the box, with no calibration needed, then the more expensive MSI PS42 is for you. Yeah, we’re getting ahead of ourselves. There’s no ambient light sensor automatically dism or brightens the display to match your surroundings. You’ll have to do that manually with the F11 and F12 keys (decrease and increase brightness, respectively). And that’s fine. If you have color accuracy needs, as designers, photographers, graphic artists, videographers do, you can always calibrate the display on your own. This is a good Netlix, YouTube, downloaded-legally video binging device, by the way. Because the sound is also loud (getting ahead of ourselves again). The keyboard is well-spaced, though a bit shallow (that’s the trend these days) but provides enough key travel (and key presses are springy) so that touch typists won’t lose their usual words per minute pace. The palm rests don’t get warm during long typing sessions (consisting usually of text editors, word processors, browsers, and chat apps). There’s none of that uncomfortable shallow feel (as though you’re typing on a desk) and noisy key presses present in MacBooks. The individual keys are spaced right and no keys are deformed or out of place except for the Up and Down arrows keys that are of the same height at the Left and Right ones, and these take some getting used to. To put this in context, with other laptop keyboards, the Delete key is “pushed aside” by a Power key; and Fn is on the right side of the spacebar, when usually it’s on the right. Because the keyboard arrangement on the 530S is so familiar, touch typists will feel right at home. Key presses on the IdeaPad 530S are also both quiet and don’t require hard presses for input to register. That said, Lenovo’s IdeaPad line is nowhere close to its ThinkPad line when it comes to the comfort and curved-surface quality of individual keys. Of course, the ThinkPad line are more expensive and look like their key design elements haven’t changed in ten years (some people want that). Still, we would have liked full-sized Up and Down keys instead of the crunched version on the 530S. And it would have been great if the keyboard was backlit. (Note: there is a variant of the 530S with a WQHD (2560 x 1440) display AND a backlit keyboard, but it’s not available in the Philippines as of this writing.) Because the only thing with backlighting on the 530S (the one we reviewed) is the CapsLk key, which is not many people use so much these days. Touchpad is large and responsive. No jumping cursors. Plastic, not glass, but not cheap-feeling. The click-through is okay, with a “decisive” bite that’s a bit too resistive and you can tell the press down is not a satisfying “click”. It’s not superb, but not bad. The touchpad has no physical left and right buttons, and no visual key to signify where they are; it’s just one big touchpad whose left and right keys are on the bottom. Fingerprint sensor placement is good, meaning not on the touchpad. Sensor is responsive and log in is fast. Lift the lid to wake up the 530S in 2 seconds, if you’ve only put it to sleep in the last hour or so, and in about 4 to 5 seconds when it’s been sleeping for way longer than that. Just a note on the fingerprint sensor. While it’s reliable for the most part, it doesn’t work when you’re finger is wet or oily or when your skin is a bit bloated after a shower. When that happens, typing in your PIN is how you log in. Sound from the two bottom-firing speakers below the keyboard is loud enough for watching movies, with dialogue distinct, and some bass seems present, but barely there. But if you’re watching videos in a noisy heap, better lift up the 530S, put it on your lap, or rest it on a cooling pad, so the speakers aren’t dampened by a surface. HD webcam placed on the top bezel, unlike other thin and light notebooks with the webcam at the bottom, which looks up at your nose. It’s HD and the output is tolerable, but not very detailed, so it’s best to hold video calls under ambient daylight or brightly lit interiors, not coffee shops with low art-deco yellowish light that’s good on food and forgiving on complexion but bad for webcams. Performance is very good – launching and switching between apps are smooth, despite having only 4GB of RAM. We’re getting 6 hours of battery life as per our usage consisting of the usual 20 Chrome tabs (without adds ons or extensions), 3 to 4 Word documents loaded, 5 text editors on, Photoshop running, and with 5 three-minute Youtube videos watched – and that work mode means videos on Facebook and YouTube deprioritized, with brightness set to 50%, with sound at 60%, with files ran using the laptop’s SSD and not via external drives, and with a wired mouse connected. No stutters, no lags, no crashes. Despite having only 4GB RAM, the IdeaPad 530S can shoulder your usual load of work. Ours is web browsing (email, research, YouTube, WordPress), writing (Word, Metapad, WriteMonkey), and Photoshop. We’ve also started quick (5 minute) video edits using the Vegas Pro 15. Modern Combat 5: Black Out on full HD graphics settings, 60 fps. No problems. We got less than 6 hours (close to 4 hours) the more videos we watched because the display is so good and the speaker sound nearly maxed out – this is a great video marathon device. The IdeaPad 530S features Rapid Charging with its 65w rather small charging brick (which we are thankful for, as we hate large and heavy brick chargers we’d have to carry). Plug it in for 15 minutes with the laptop off, and you get up to 2 hours of use. With the laptop on, 15 minutes of charging gets you around 13% more battery charge, and full charging takes under 2 hours. So if it’s better to charge with the laptop off to get the Rapid Charge benefit. We think the IdeaPad’s MX 150 graphic card will be enough to keep casual gamers happy (and “casual” these days now includes FPS titles with medium to low framerates), although some graphically demanding games should be dialed down in framerates. Note that the same graphic card is found on the more expensive MSI PS42 (P76,995). To be fair, the PS42 runs on a Core i7, 8GB of RAM, 512GB SSD, has a lighter body, and has sharper, has a color accurate display out of the box, and rarely gets uncomfortably warm, which is our next topic. When playing PC games, you need something to raise the underbelly of the IdeaPad 530S to let out the heat. But if you’re not playing games, you don’t need to – the notebook’s underside rubber feet provide enough elevation. Remember, the Lenovo IdeaPad 530S wasn’t designed to be a gaming laptop, a device often specially assembled for thermal management, so the heat was expected, can be dealt with, and it not a deal-breaker. Great selection of ports – see image above. We’d have wanted 3 Type A 3.0 USB ports, so we could plug in a mouse and two external drives, but 2 USB ports would be enough for most people. Plus, Type C multi-port hubs are in fashion, which multiplies your USB ports if ever you need more (see image below.) There’s even a full-sized SD card slot for content creators – something that’s missing in other laptops. Now, the lone Type C port is neither Thunderbolt-ready nor can you charge the notebook through it, which would have been great so you can charge it with high ampere powerbanks (and so that the barrel charging port could be dropped in favor of another Type C port). Still, the single Type C port can charge plugged in devices, like your smartphone, tablet, Bluetooth earphones, power bank, and it also takes in multi-port hubs. There’s only one RAM slot with one 4GBDDR4 2400 already installed (you can go up to 16GB RAM) and an extra M.2 slot for an extra SSD; and those are your only upgrade options. Below are some 14-inch notebooks within the same price range (all of them have an 8th Gen Core i5 and MX 150 graphic card) and how they compare (on paper, as I haven’t reviewed them) against the P49,992 Lenovo IdeaPad 530S. The exception is the HP Envy, which has the same specs save for a smaller 13.3 inch display. ASUS Vivobook S14. P47,995. Same specs as the Lenovo IdeaPad 530S, but with matte display for better outdoor visibility, a micro SD card slot (no full SD card lot), a predominantly plastic build (save for the lid), and a slightly smaller 42Wh battery. If you add P3,000 more, you can get the version with a 1TB HDD+256SSD, and a backlit keyboard. Dell Inspiron 7472. P49,990. Same specs, except for a 128GB+500GB HDD storage, backlit keyboard, no Type C USB port, no fingerprint sensor, a smaller 41Wh battery, and bottom-placed webcam for nose hair video conferences. MSI PS42 8M-211PH. P54,995. Same specs except for having no discrete graphic card (only Intel HD620 shared graphic), white backlit keyboard, a bigger 50Wh battery, 8GB RAM, bottom-placed webcam for nose hair video conferences. The display is also color accurate out of the box. But the shiny and boxy design might not be for everyone. We reviewed the pricier Core i7 variant with MX 150 (PHP76,995) here. HP ENVY 13-AH1025TX. P59,990. Same specs save for a smaller 13.3-inch display, a backlit keyboard, a micro SD card slot (no full SD card slot), a much more premium metallic chassis, and better speakers (on paper), which has the Band & Olufsen branding. Acer Swift 3 SF314-53G-550F Iron Man Edition. P52,999. Same specs except with more RAM (8GB), a bigger 48Wh battery, a backlit keyboard, and an aluminum body. The Marvel branding pulls up the price (the non-Marvel version is cheaper, if you can find it, and looks more low key than the Iron Man edition’s screaming red). On paper the Swift 3 seems better than IdeaPad 530S but the big-bezelled “Display is dim, with poor contrast,” says this review. Check out the P49,992 Lenovo IdeaPad 530S at Villman. Or you can order it through Lazada where it’s priced lower (at P47,495). Please note, at the time of this writing, we’ve not held these other laptops, save for the MSI PS428R (Core i7 variant), and cannot vouch for how good their build is, how comfortable they are to type on, and how nice or poor their display is. We included these so you won’t be looking at the Lenovo IdeaPad 530S in a vacuum – there are other choices out there, some perhaps better suited to your needs. Keyboard is not backlit, unlike most of the other laptops above (see “The Competition”). While it’s not a problem for a touch typist like me, but some of us prefer being able to work in dimly-lit interiors or in complete darkness. The smallish Up and Down keys, which are squished together, are of the same heigh as the Left and Right ones. This can take some getting used to if you’re used to full-sized arrow keys for moving the cursor in documents or for doing Page Up and Down motions. 4GB of RAM can be limiting depending on your work flow. It’s actually sufficient for the usual browsing, document work, light image editing, and very light video editing – there were no annoying slowdowns or crashes. However, we wish the RAM was at least 8GB so you can abuse your Chrome tabs (20 and more) and still have your big spreadsheets and 70-page documents responsive. “Only” 6 hours of battery life, which is a bit above average considering that the other laptops above have smaller batteries (ASUS Vivobook S14 = 42Wh, Dell Inspiron 7472 = 41Wh, but the Lenovo IdeaPad 530S = 45Wh) and that the Core i7 MSI PS42, which has a bigger 50Wh battery, only lasts just above 6 hours. Still, we wish the battery of the 530S lasted longer. P50,000 can feel a bit steep if you’re “only” getting 4GB RAM and 6 hours of battery life. But then, most 8th Gen Core i5 laptops within the P50k price range (see “The Competition” above), usually have only 4GB RAM, except for the Acer Swift 3, which has more RAM (8GB) and presumably longer battery life (with a bigger 48Wh battery), but has a poor display (as per this review). So it’s up to you if you prefer good multitasking (needs more RAM) and long battery stamina but with a poor display, over sufficient RAM and longevity plus a great display. As for the battery life, see preceding paragraph. Gets warm during PC games when on a flat surface – such as a desk, or on your lap. While the laptop doesn’t get hot during video marathons, Photoshop work, and all the browser tabs and documents running, playing PC games seems to get the upper left side of the keyboard (under where your left hand’s fingers would be hovering when typing) and the left and middle underbelly areas, noticeably warm. Maybe this is a reminder that the Lenovo IdeaPad 530S wasn’t designed for intense long-hours of PC gaming, unlike gaming laptops with a commensurate heat management set up. But like we said, this happens when the laptop is on a flat surface. Raising it with a cooling pad or those plastic/rubber feet you can buy for cheap significantly reduces the heat, so you can keep playing games or keep on typing. So get a cooling pad if you plan to play games on the 530S. And now for the nitpicks. Slightly heavy, at 1.5kg, for a thin and light laptop. The 1.19kg MSI PS42, by comparison, is amazingly light. But we don’t find this extra weight a burden (get it?) because of the 530S’ sturdy build, which reassures us every time we lift it and when it bumps into something (or someone) when we’re carrying it around. Bloatware (McAfee LiveSafe and WebAdvisor, and Lenovo apps) can be intrusive (and consume resources) but can be disabled or uninstalled (you can always do a factory reset). You can also just disable annoying notifications from them. HD webcam not the sharpest, but it’ll do the job, and it’s not found at the bottom of the display. So yeah, none of those nose hair video conferences. The Lenovo IdeaPad 530S probably has the most premium build among the PHP50,000-priced upper midrange laptops with an NVIDIA GeForce MX150 (25w) graphic card. Its awesome features (quiet-elegant-sturdy design and build, very good anti-glare display, comfy keyboard, good number of ports, generous and responsive touchpad, very good performance) is not offset, we think, by its non-backlit keyboard, lack of Thunderbolt-ready Type C port, and average battery life (considering the price and that it has a discrete graphic card). We recommend the Lenovo IdeaPad 530S over similarly spec’d and priced laptops because of these awesome features. Plus, it’s slim enough, light enough, and can handle getting squished in your backpack or a heavy cat sitting on the closed lid. Having said these, there are caveats: gamers will have to contend with lower framerates (as this isn’t designed to be a gaming laptop), those who require color accuracy will have to calibrate the display a bit, and if your work flow requires continuously working with simultaneously running “heavy” documents (large file spreadsheets and documents in the hundreds of pages), you’ll need more than 4GB of RAM. The Lenovo IdeaPad 530S probably has the most premium build among the PHP50,000-priced upper midrange laptops with an NVIDIA GeForce MX150 (25w) graphic card. The awesome things about it (quiet-elegant-sturdy design and build, very good anti-glare display, comfy keyboard, good number of ports, generous and responsive touchpad, very good performance) is not offset, we think, by its non-backlit keyboard, lack of Thunderbolt-ready Type C port, and average battery life (considering the price and that it has a discrete graphic card). 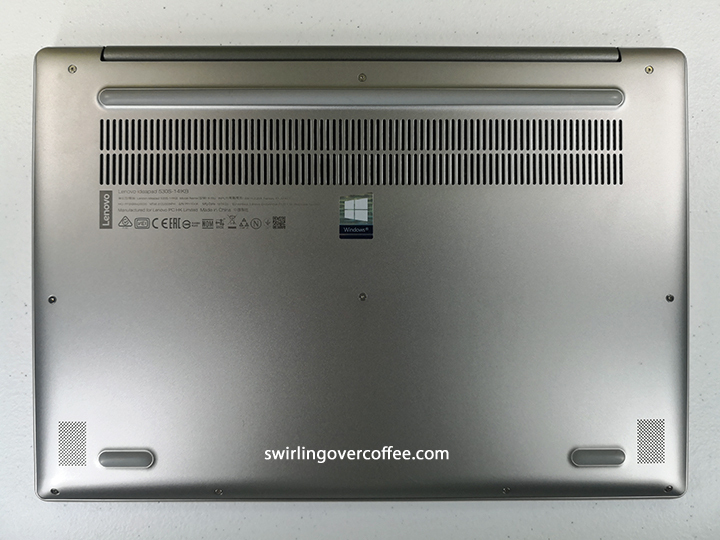 Swirlingovercoffee.com recommends the Lenovo IdeaPad 530S primarily because of the sturdy build, quiet design, and very good display. It's slim enough, light enough, and can handle getting squished in your backpack or a heavy cat sitting on the closed lid. However, gamers will have to contend with lower framerates (as this isn't designed to be a gaming laptop), those who require color accuracy will have to calibrate the display a bit, and those who often handle super large document files may want more than 4GB RAM.